Leasing Available from $13.11 per month! Leasing Available from $44.69 per month! Companies that require and/or want A3+ capabilities can produce marketing proofs and large graphics, spreadsheets, architectural plans, or financial ledgers; with HP's A3+ capabilities, the printable surface on the page is larger than what you'll experience with competitor A3 printers. 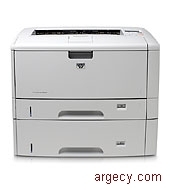 This black-and-white A3 HP laser handles anything you throw its way and delivers crisp, clear output. With fast speeds, a powerful 460 MHz processor, expandable memory (up to 512 MB), industry-leading networking, and ProRes 1200, you won't be disappointed. - Work more quickly and efficiently with fast print and short first-page-out speeds. - Experience fast, worry-free performance with a 460 MHz processor and expandable memory. - Fast, industry-leading networking allows for easy, efficient sharing of printing resources. - Undisputed image quality- you can expect outstanding black-and-white output page after page. Don't let your equipment hold you back. HP's black-and-white wide-format laser has the versatility and expandability- accessories and third-party solutions- to fit your current and growing needs. 11x17 (A3)+ capabilities enable more printable space. - Increase your options- CompactFlash support enables a wide range of third-party solutions. - Easily produce marketing proofs and other specialized materials with 11x17A3+ printing capabilities. - The less you interact with your printer, the better. That's why HP offers expandable paper input. HP knows you want to spend as little time as possible managing your equipment. That's why we've designed this device, its supplies with HP Smart technology, connectivity options, and management tools to make your experience efficient and effortless. - Proactively manage your printer and fleet of devices with Web Jetadmin. - Experience the simplicity of HP LaserJet print cartridge design. - Printing is easy with HP's all-in-one print cartridge design. - Supplies management is easy with the HP LaserJet print cartridge and HP Smart printing technology.